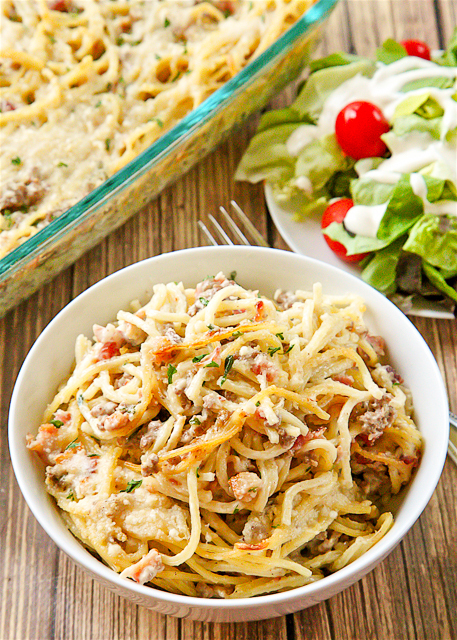 Bacon and Beef Pasta Casserole - INCREDIBLE! SO GOOD! Blown away with this easy casserole. Spaghetti, bacon, hamburger, onion, red pepper, Roasted Garlic Alfredo sauce, parsley and parmesan cheese. This was out of this world delicious! Tasted like carbonara. It is now in our dinner rotation! I found this recipe in one of my cookbooks when we moved. I bookmarked it when I was going through books to keep and books to donate. I thought with a few tweaks, this might be really good. Well, I was right. We both absolutely loved this!! It was incredible. It reminded both of us of our favorite carbonara recipe. 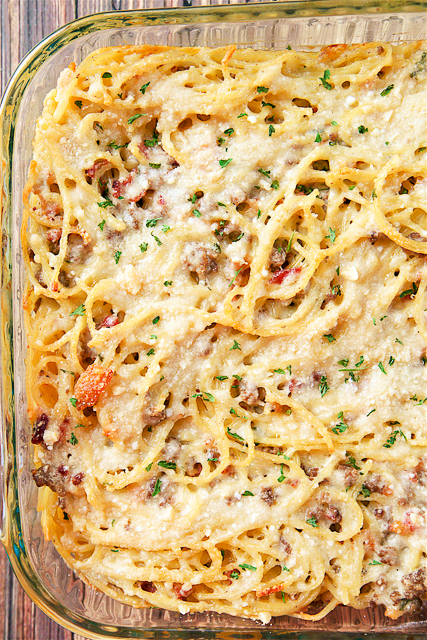 This Bacon and Beef Pasta can be made ahead of time and frozen or refrigerated until ready to bake. All you need is a side salad and some garlic bread and dinner is ready. This would be great for holiday dinner parties. I know I plan on making this again very soon. I can't stop thinking about how great this pasta casserole tastes. We usual make lasagna on Christmas Eve, but I might make this instead. SO good!! Preheat oven to 375º F. Lightly spray a 9x13-inch pan with cooking spray. Set aside. Cook pasta according to package directions. Drain and transfer to large bowl. In a skillet, cook ground beef until no longer pink. Drain. Stir in bacon pieces, onion flakes, red pepper flakes, Alfredo sauce and parsley. Pour sauce over cooked spaghetti and toss to combine. Transfer pasta to prepared baking dish. Sprinkle with parmesan cheese. Bake for 30 minutes, until golden brown on top. Have you tried this using ground turkey? If so did it work out well. I have it, but I am sure that would be fine. Enjoy! This looks like the perfect meal! I love that it's freezable and I'm all about making things ahead so I can just pop it in the oven when I get home!